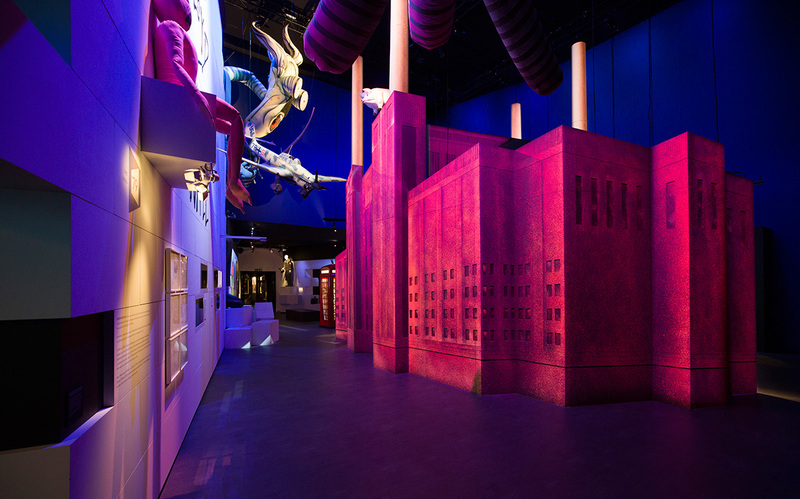 The Pink Floyd Exhibition: Their Mortal Remains is an immersive journey through the world of Pink Floyd. The show begins with a look at the band’s early digs gigging in London’s underground music venues and goes on to explore the making of their most famous albums – from Animals to Dark Side of the Moon. 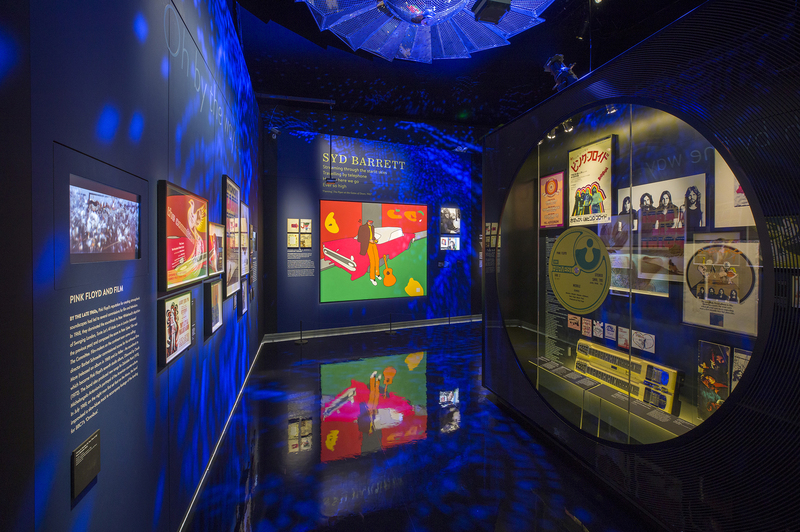 The exhibition was conceived by the late Storm Thorgerson and developed by his Hipgnosis creative partner Aubrey ‘Po’ Powell. Pink Floyd’s visuals are a key focus of the show – it is as much a celebration of the band’s iconic album art and theatrical live performances as it is their music. 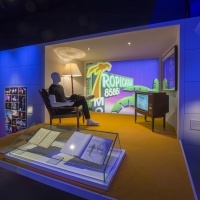 Scaled models of set designs are shown alongside inflatable puppets, music videos, animations, tour programmes and sketches for album covers, offering a look at the process and ambition behind the band’s visual output. 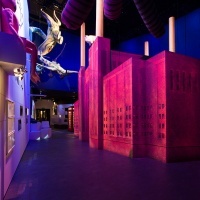 Exhibition designers Stufish have created several large-scale installations, including a nine-metre high model of Battersea Power Station for a section on Animals and a giant mirror ball based on the one used in the band’s 1994 Division Bell tour. 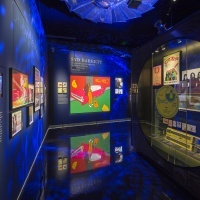 With its mix of large and small-scale exhibits – and unseen ephemera, letters, drawings and photographs from the archives – the show is a treat for both fans of Pink Floyd and anyone with an interest in their influence on visual culture. 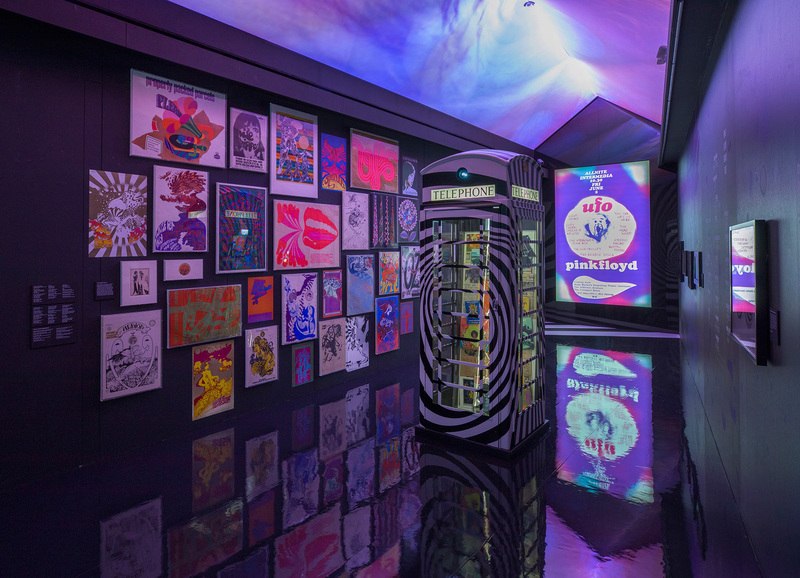 The exhibition begins with a look at pyschedelia and the counter-culture movement from which Pink Floyd emerged in the 1960s. Ads for underground music venue the UFO Club (which opened with a set from the band in 1966) are showcased alongside gig posters and articles on ‘experimental happenings’ in London. 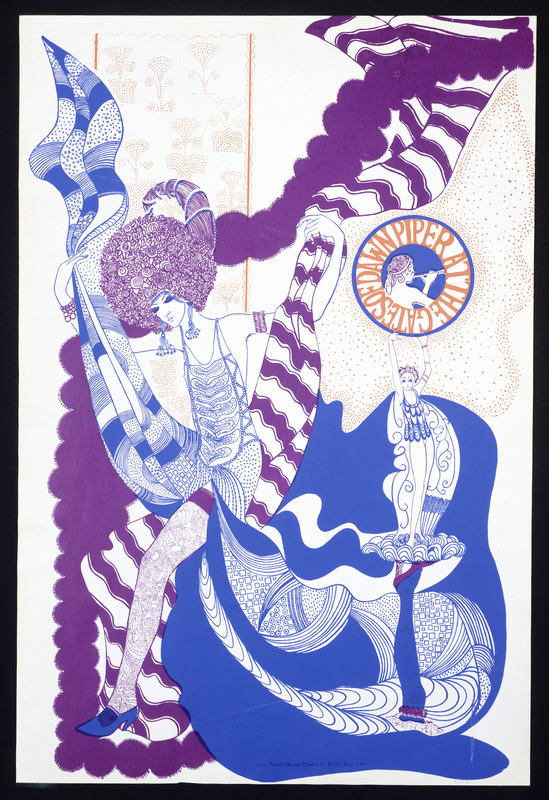 There are some great posters on display – from designs by Victor Moscosco and Michael English and Nigel Waymouth (also known as Hapshash and the Coloured Coat) to one for Pink Floyd’s debut album The Piper at the Gates of Dawn. 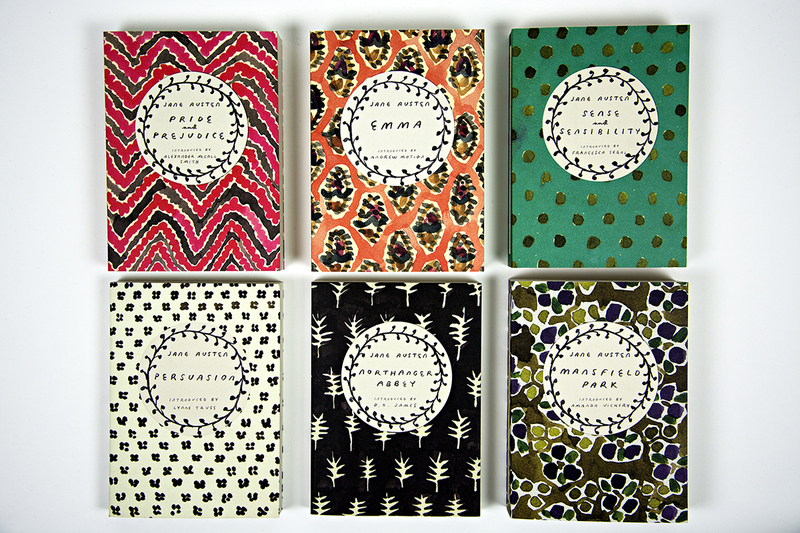 The selection captures the stylised lettering, intricate patterns and acid brights that defined the artwork of the time and inspired the band’s aesthetic. Circular screens are now a signature feature of Pink Floyd gigs. The band first used one in 1974 – lighting and production designer Arthur Max created a 40-foot wide screen for the band’s tour of France that was used to project animations by Ian Emes and film sequences by director Peter Medak. 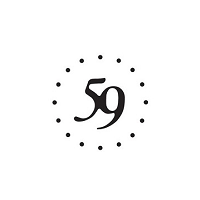 Emes was invited to collaborate with the band after his animation project French Windows – a four-minute sequence set to Pink Floyd song One of These Days – was shown on the Old Grey Whistle Test. He created the sequence as an art student in Birmingham and drew inspiration from the work of Man Ray and surrealist artists. 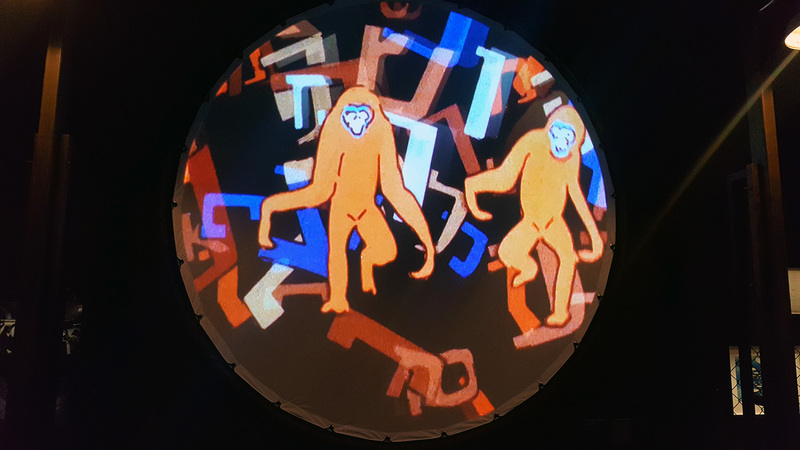 The sequence is shown on a replica circular screen in the exhibition alongside hand-drawn storyboards and another animation created to accompany a performance of the song Time. Pink Floyd’s The Wall tour was an elaborate production involving large-scale inflatable puppets, eerie masks and a wall that separated the band from the audience. 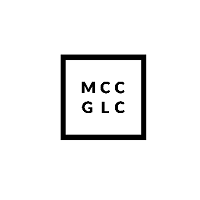 The album follows the story of a troubled rock star who isolates himself from the outside world after struggling with loss, abuse and the breakdown of his marriage. 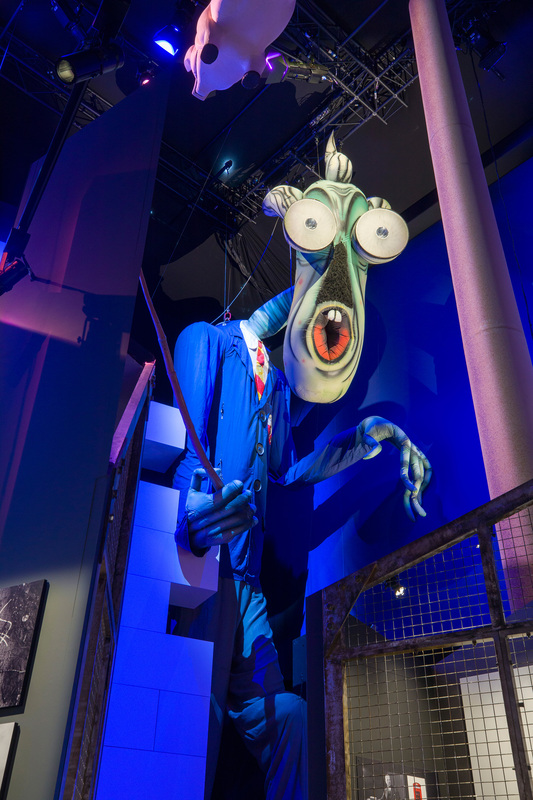 Mark Fisher and Jonathan Park designed the live show based on sketches drawn up by Waters while illustrator Gerald Scarfe designed puppets based on characters depicted in the record. The original production visited 31 cities in 1980 and 1981 and a later tour featuring more advanced puppets ran from 2010 to 2013. 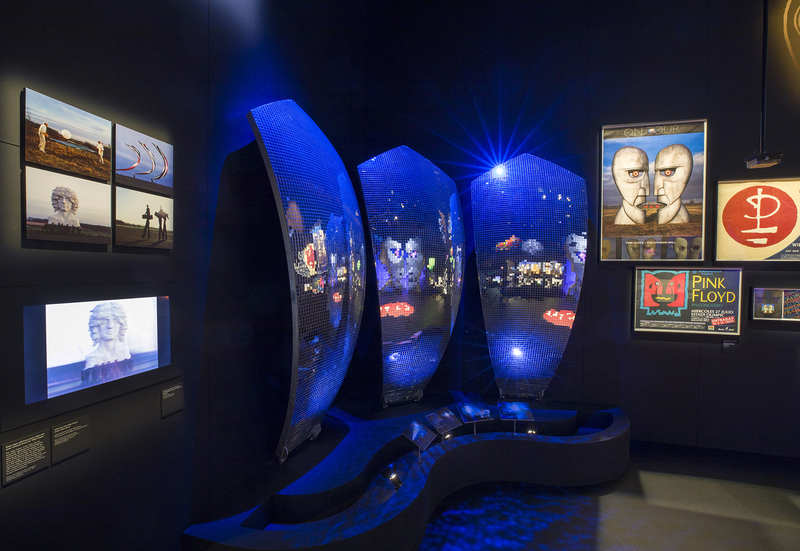 Waters’ early drawings are displayed in the exhibition alongside clay models of the show’s ‘Wife’ and ‘Mother’ inflatables and masks worn by children in the video for track Another Brick in the Wall. 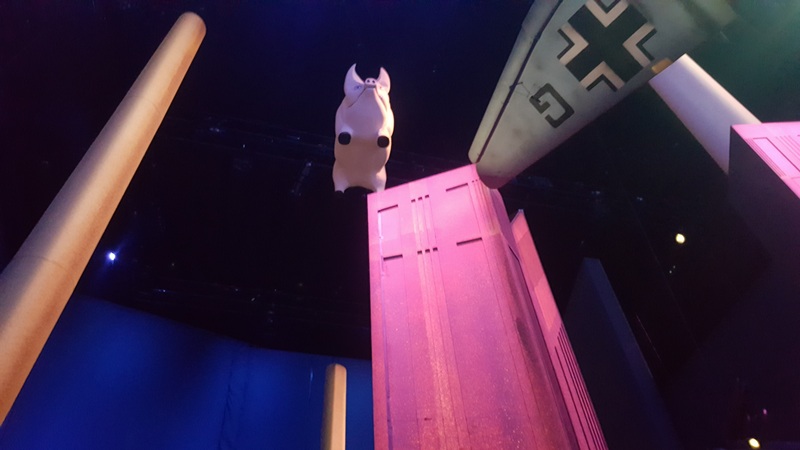 Suspended from the ceiling is a vast inflatable ‘Teacher’ created for the 2010-13 tour – the kinetic puppet highlights the scale of the show and hangs alongside a replica of the pink pig featured on the cover of Animals. 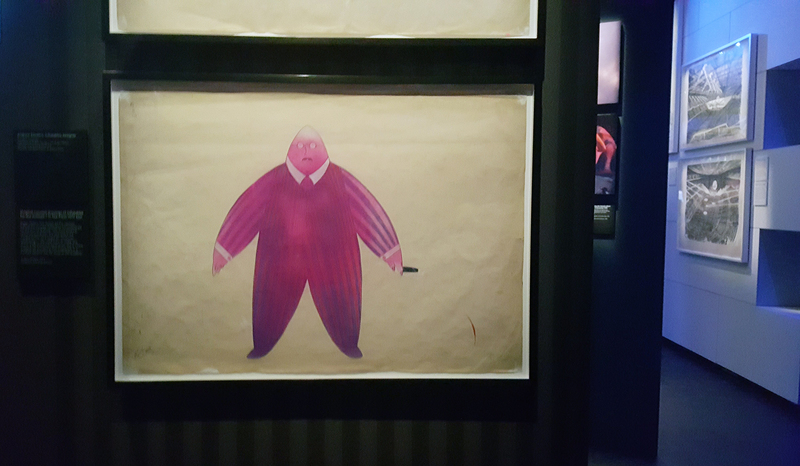 Nearby are concept paintings by Scarfe for the teacher, which show him spewing bile into the mouths of young children. 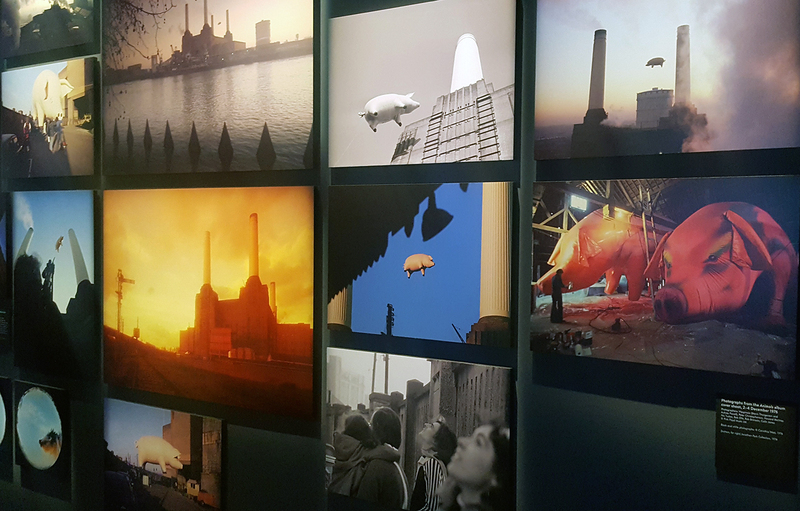 Roger Waters conceived the cover design for Animals while driving through Battersea to record at the band’s studio in Islington. 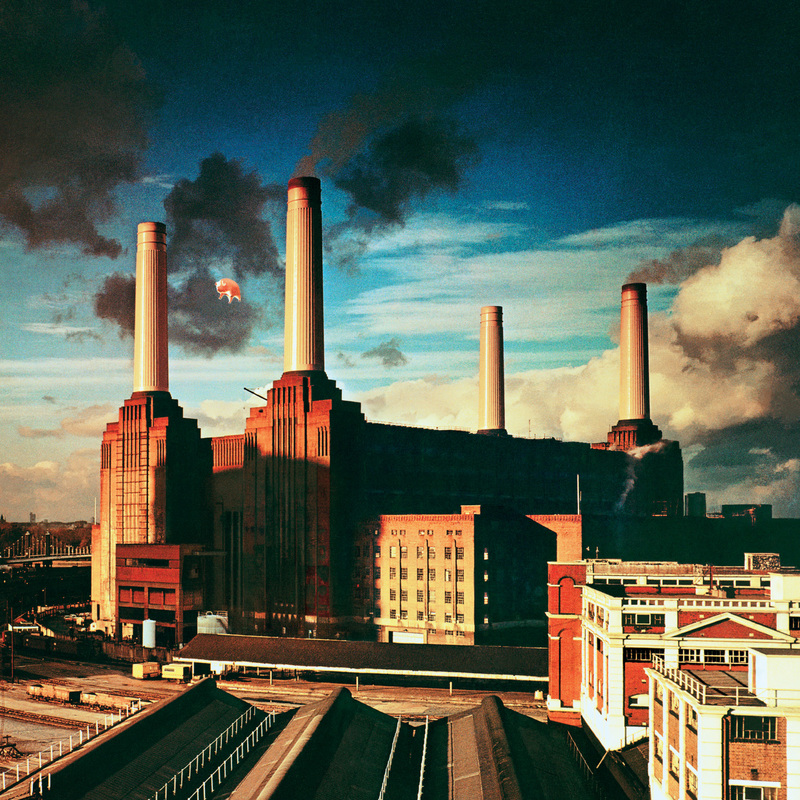 The image shows a bright pink pig floating over Battersea Power Station – a reference to both the record (inspired by George Orwell’s Animal Farm) and the phrase ‘pigs might fly’. 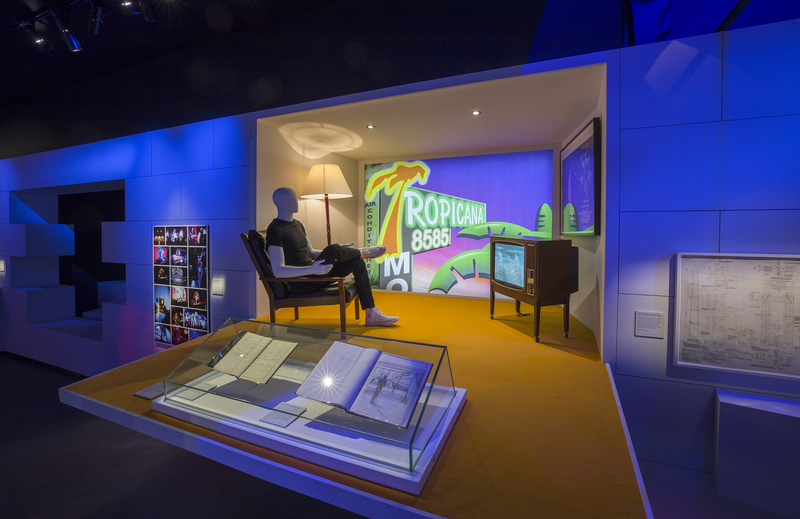 The exhibition includes a number of stills from the cover shoot as well as annotated concept artwork from the Hipgnosis archives. 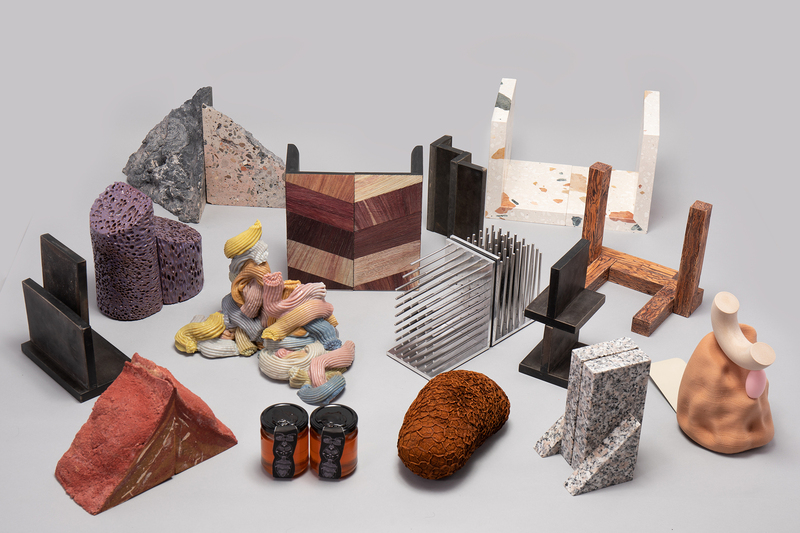 Material is displayed alongside a nine-metre high model of Battersea Power Station created by Stufish. Also on show are original concept drawings for the inflatables featured in the band’s Animals / In The Flesh tour. 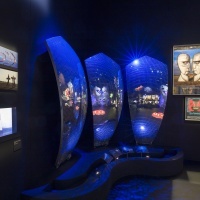 An adjoining room contains a holographic installation based on the cover design. 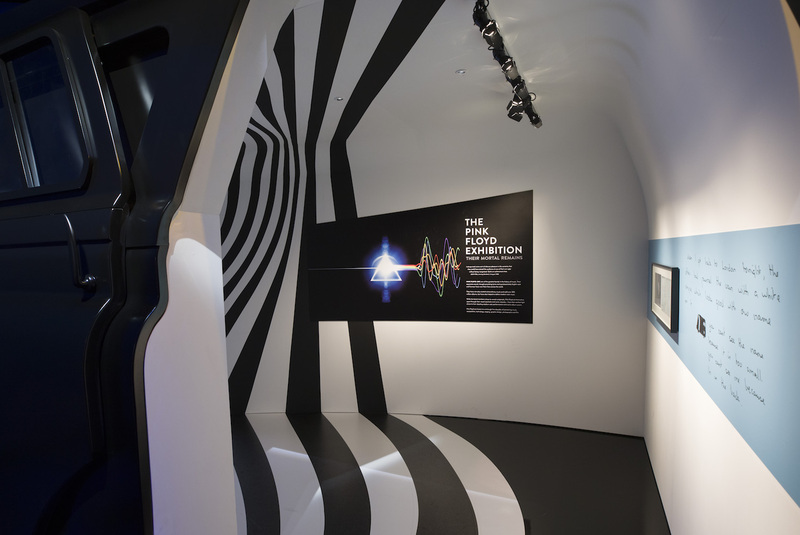 Visitors are invited to gaze at the installation while listening to Pink Floyd’s music on headphones – an oddly mesmerising experience that brings the instantly recognisable image to life. Storm Thorgerson’s cover for Pink Floyd’s 1994 album The Division Bell is inspired by the idea of communication. 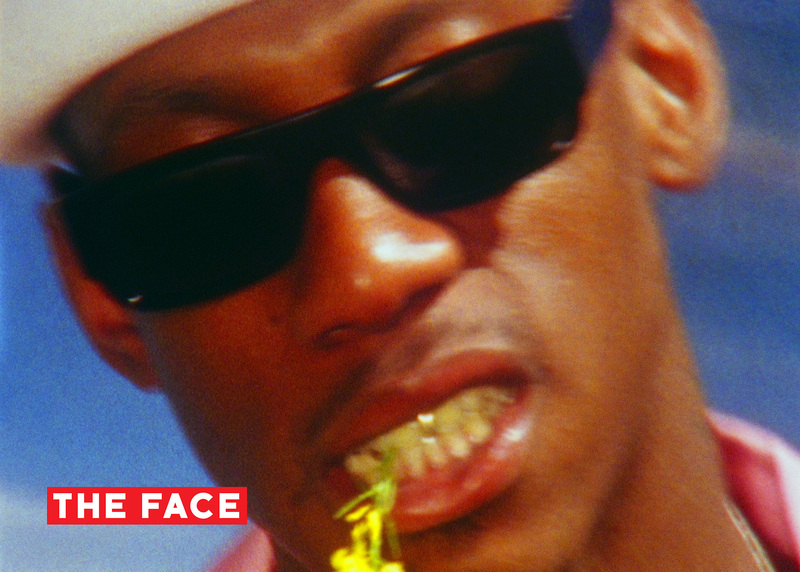 The image was shot in a field in Ely and shows a pair of metal heads facing each other as if engaged in conversation. 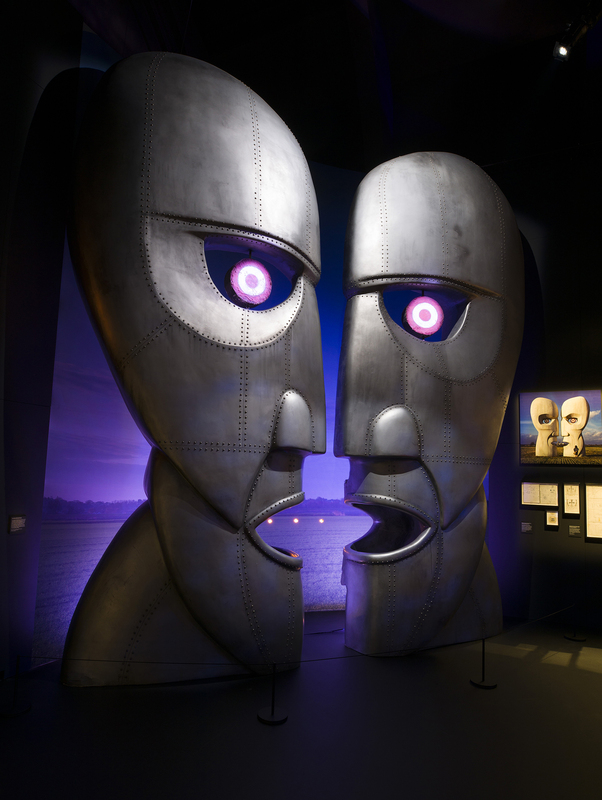 Images from the shoot are shown alongside Thorgerson’s sketches and six-metre tall models created for the Division Bell tour. There is also a model of the curved stage devised for the tour by lighting designer Marc Brickman. Cover art for Wish You Were Here by Hipgnosis. 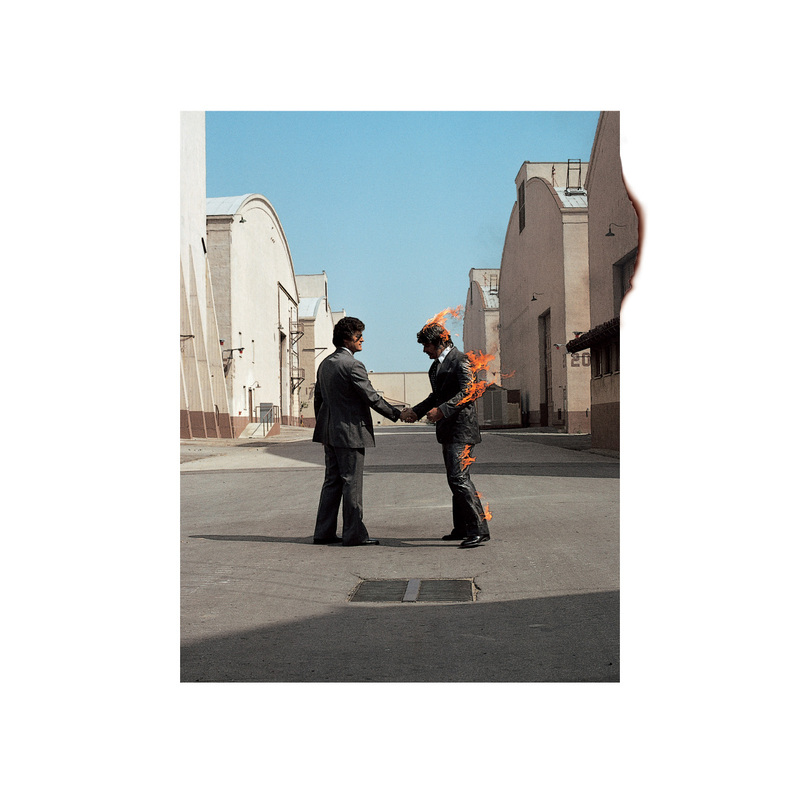 The cover for album Wish You Were Here shows a man being set alight as he shakes hands on a business deal. Like the artwork for The Division Bell – and many of Hipgnosis’ covers for Pink Floyd – it was created for real and the man really was set on fire. The powerful image is projected on to a wall in the exhibition. 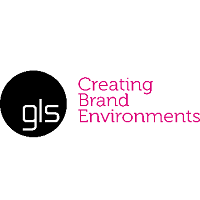 It is displayed alongside the original photograph and images from the shoot that show assistants standing by with fire extinguishers. 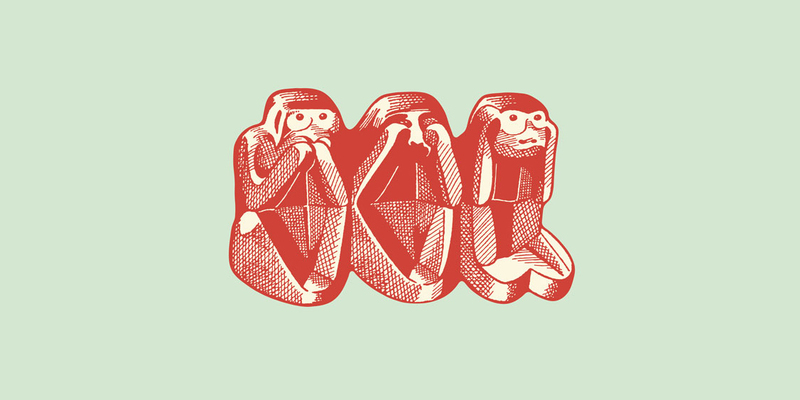 An accompanying manuscript written by Thorgerson explains the creative process and concept for the artwork. 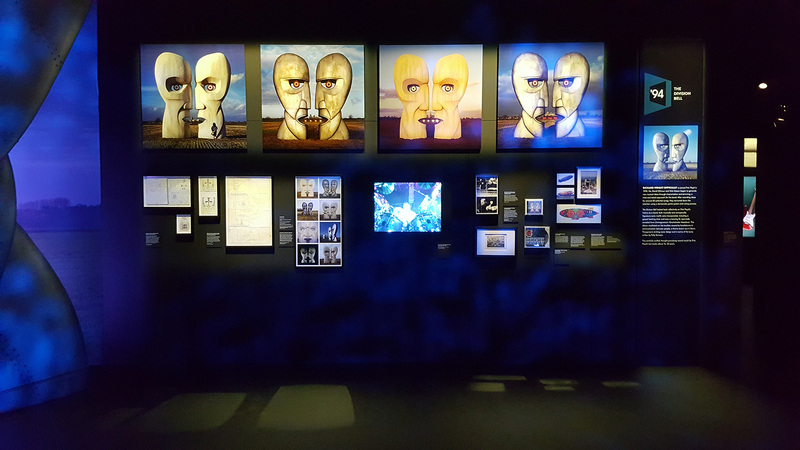 As well as celebrating Pink Floyd’s experimental approach to visuals, Their Mortal Remains highlights the band’s innovative use of new technologies. 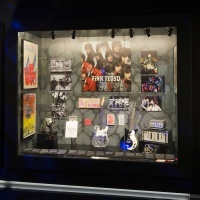 The band was one of the first to use synthesisers in their music and a Mini Moog synthesiser owned by Richard Wright is displayed alongside hand-painted drums and custom guitars. 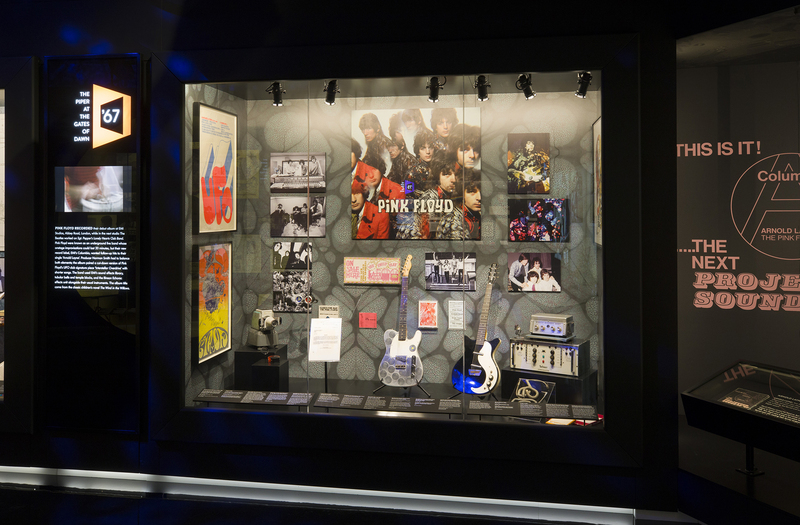 A glass-fronted display includes over 50 instruments while an interactive element allows visitors to mix their own version of the track Money. The exhibition opens with a larger-than-life model of the band’s Bedford Van. The replica is over twice the size of the original vehicle that the band used while touring in the early 1960s. It’s a lovely way to kick off the show – inside the model is a hand-written letter from Roger ‘Syd’ Barrett to his then-girlfriend with a small picture of the freshly painted van. 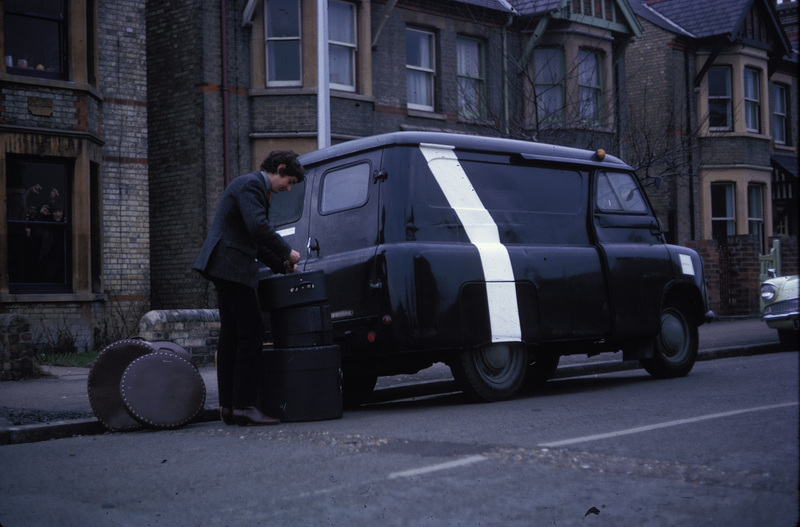 “When I got back to London tonight the others had painted the van with a white stripe, which looks good with our name on it,” Barrett writes. 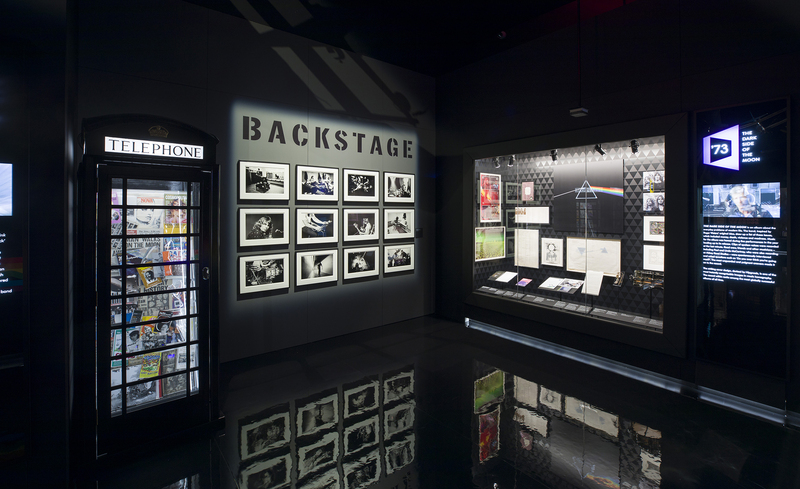 Capturing the scale or impact of a Pink Floyd gig in an exhibition space is an impossible task – the band played to vast audiences in some of the world’s biggest arenas – but a performance room at the end of the exhibition aims to give some sense of the spectacle. Footage of the band performing Comfortably Numb at Live 8 (their last performance on stage together) plays out across multiple screens while sound blasts from 18 loud speakers and seven sub woofers. It’s a suitably ambitious ending to a spectacular show – one that has already sold tens of thousands of tickets. The V&A’s Bowie exhibition was a massive success – attracting 1.8 million visitors – and Their Mortal Remains looks set to be another huge hit. 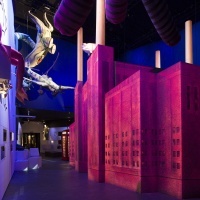 The Pink Floyd Exhibition: Their Mortal Remains is at the V&A from May 13 until October 1. For details and to book tickets see vam.ac.uk. 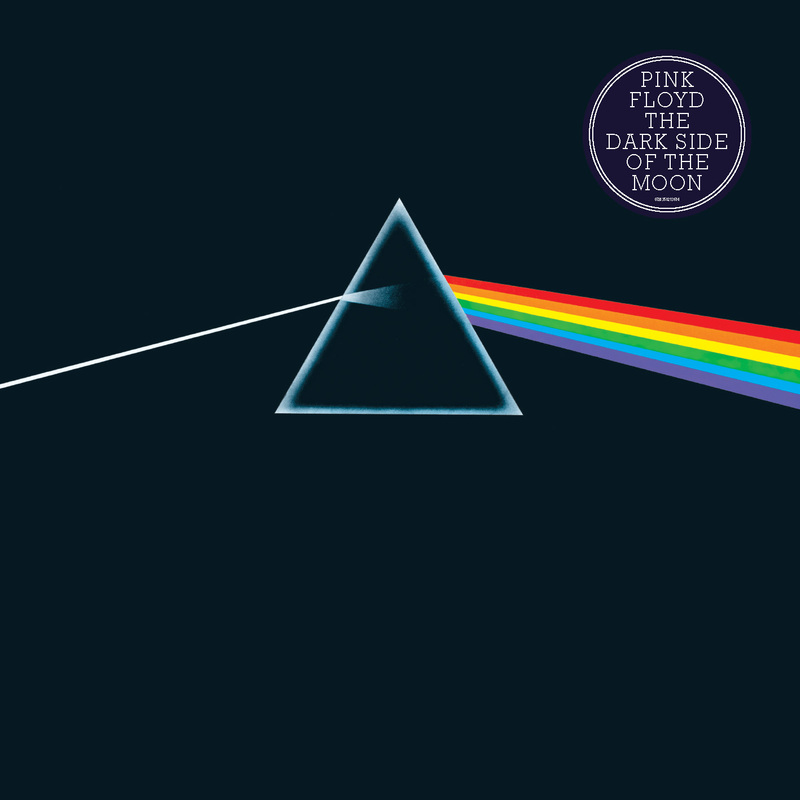 You can read our interview with Aubrey Powell here or see our feature on Pentagram’s visual identity for Pink Floyd Records, which takes inspiration from the cover of Animals and the Bedford Van.